Former U.S. Congressman John Dingell was an extraordinary friend to our state, our region, our community, and to all of us at Henry Ford College. Like so many of you, I was deeply saddened to learn of John’s passing on February 7. 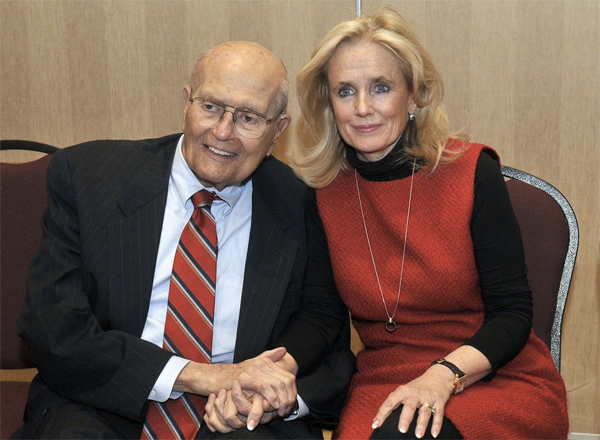 I offer heartfelt condolences from all of us to John’s wife and our good friend, Congresswoman Debbie Dingell, and to the extended Dingell family. John’s career of public service was remarkable. He joined the U.S. House of Representatives in 1955, representing Michigan’s 16th district and succeeding his father, John Dingell Sr., who held the seat for 22 years. John served for nearly 60 years, until 2015, becoming the longest-serving congressperson in U.S. history. John was also the longest-serving Dean of the U.S. House of Representatives and one of the final two World War II veterans to have served in Congress. He was a long-time member of the House Energy and Commerce Committee, serving as its Chairman for many years. In 2014, President Barack Obama awarded John the Presidential Medal of Freedom. As impressive as his list of national accomplishments is, John Dingell and Debbie have been devoted community members. Their home is here in Dearborn, and both have been as active on the local scene as the national scene. In 2011, he hosted a town hall meeting at the College to discuss the newly-implemented Affordable Care Act, of which he was a primary champion. John wanted students and other voters to understand the benefits of the new law, and he wanted to put a human face on the issue of expanding access to health care. His goal was that every citizen should have the health care they need. He was instrumental in the 2012 passage of the U.S. Department of Labor’s Trade Adjustment Assistance Community College Career Training Program, and he lauded HFC as the leader among 13 community colleges participating in the $15 million grant. A tireless advocate for access of all kinds, John pushed for the completion of the subsequently-named John D. Dingell Transit Center in Dearborn. Part of the purpose of that Center was to make our College more accessible to students seeking higher education and career opportunities. John had a soft spot for the young leaders of tomorrow, and he always made time for them. He spoke at one of the annual Michigan Student Political Issues Conventions, hosted on the Henry Ford College campus. His wife, Debbie, has carried on that tradition, speaking most recently at last year’s Convention. In recent days, my office reached out to people who had known and worked with John Dingell. We received so many wonderful notes about John, and I want to share a few of them with you. There was never any doubt John would lend a friendly listening ear at any time. He was a dedicated supporter of our College motto in his own life: For the Good of All. I encourage all of you to learn more about this historical leader. You will see a life of getting things done for people through collaboration, communication, and compromise. He showed us that true leaders work across disagreements to make progress for all, rather than just seeking to win political victories. We will miss John Dingell deeply. I cannot overstate our gratitude to him for leading the way, and for lighting the way for the leaders who would follow. Our nation, our state, our community, and our College are immeasurably better for having known John. What a privilege it was to have this great man in our midst. I hope all of us will find something in John’s life that can serve as an inspiration for our own lives, For the Good of All.